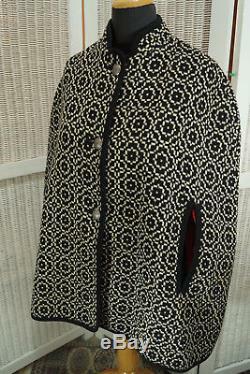 This beautiful Welsh-made vintage tapestry cape from the 1960s or'70s is woven in an eye-catching black-and-white geometric pattern and is lined with red satin. It does up in front with three decorative pewter buttons. One size suitable for a wide range of sizes. It is in great condition outside and inside! Shoulder width (approximate): 20.5" / 52 cm Length (center back to bottom): 30.5" / 77.5 cm Circumference at bottom (measured flat and doubled): 66 / 168 cm Thank you for your interest, and please take a look at the other items. A nonprofit English-language youth library, learning and culture centre in the Czech Republic. In addition to checking out my other listings. Please mention the promotional code BLUEOWL15. The item "Vintage Welsh Tapestry Cape Geometric B & W Wool Poncho Satin Lined Free Size" is in sale since Wednesday, January 24, 2018. This item is in the category "Clothes, Shoes & Accessories\Vintage Clothing & Accessories\Women's Vintage Clothing\Coats, Jackets & Waistcoats". The seller is "blueowlbohemia" and is located in elezný Brod, .